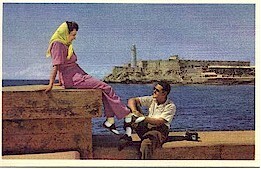 Sending a vintage Cuban postcard is easy. Just follow the step-by-step instructions. After you have designed your post card, you will be shown a preview of it which you can edit and modify until you're satisfied. Once you send it, your recipient will receive an e-mail letting them know how to retrieve your card. Select a picture from the list below by clicking the little Circle Button next to your choice. You may only pick one picture per card. 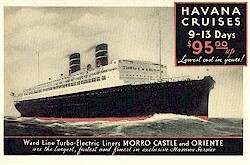 (Click on the picture to see a full size image of the card) You might want to pick and choose your picture before filling in any information on this page, just so you do not risk losing your work after returning from viewing full size images. 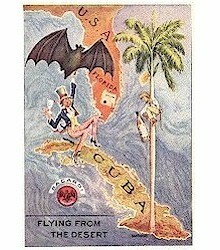 Bacardi A classic post card dating back to the beginning of the 20th century produced by the Bacardi Rum company. Venga a Visitar! Only 90 miles from Key West. 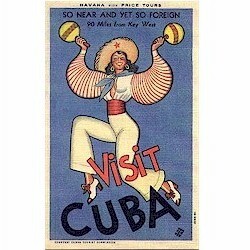 It has always been there, luring dreamers, lovers, gamblers and latin lovers. 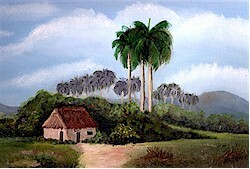 Querida Cuba, la perla del Caribe! 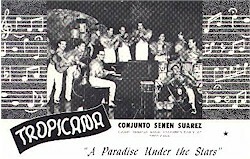 La Tropicana "A Paradise Under the Stars", the card reads. Say the name in any part of the world and a smile will form on everyone's faces.. Tropicana!. Catedral de Cardenas How many generations were baptized here, grandparents, cousins, neighbors and friends gathered round, a sunny morning and a balmy breeze swirling through the plaza. Que recuerdo mas lindo. 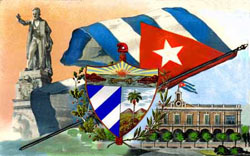 ¡CUBA! Ni más, ni menos. In all her glory, in all her splendor, la perla de las Antillas lives in the hearts of the children of her soil wherever they may be while enchanting forever the visitor who wanders her sandy shores. La Finquita del Campo Gaze upon this image and weep. Could life be any more serene than on this idylic farm in the country. Subete a la carreta! 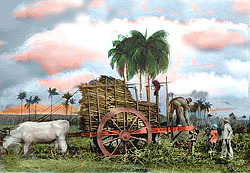 The tradition of the cane. The pride of a hard day's work. The future is bright and the carts still ply the road back home. 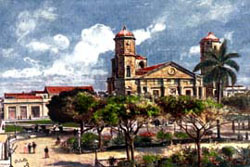 El Catedral The Plaza frente al catedral doesn't look any different today than it did one hundred years ago. The music in the cafés plays on and children still chase each other through the groups of Sunday strollers. 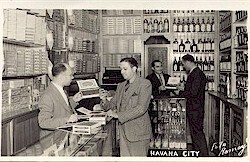 There's never been any cigar quite so fine as a fresh Cuban. Imagine a leisurely afternoon con el tabaquero, discussing the finer points of the perfect puro. 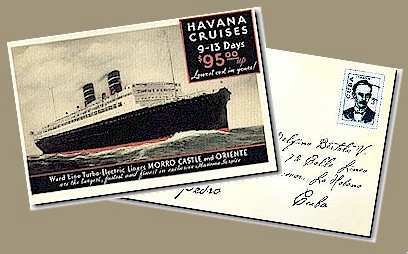 Havana Cruise Imagine a weekend cruise filled with music and romance to el puerto de La Habana. Imagine what it was like 40 years ago. Imagine it today... imagine it ten years from now! El Malecon de los Amantes Standing on the ramparts of El Castillo del Morro, looking out along the long slow crescent of El Malecon. Strollers amble along, dodging the breaking waves, then stop to admire the view. 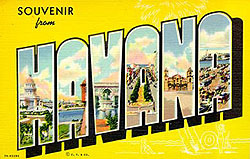 Havana Beckons Ever alluring from days long past to those days certain to come, the bitter-sweet pull is ever present, to walk her streets, smell her ocean breezes, to amble along in the sweet embrace of this old city by the sea. La Bandera y el Escudo May we never lose touch with the pain that so many have endured and may it further our resolve to never let freedom be any less precious than our next breath. Go with our picks, or choose your own colors. Use the two selector pulldowns below to select your text and background colors. Obviously, you'll need to pick two different, contrasting colors so your recipient can read your message! Now, mi amor, enter your personal message in the box below. Pick a song to match your mood, go with our favorito, or select Nada! Click NEXT STEP to preview your card. You'll still be able to edit it by hitting your BACK button, making your changes, then hitting NEXT STEP again. Go back-n-forth 'til it's perfect! Your card will not be sent until you press the SEND-CARD button on the preview screen.